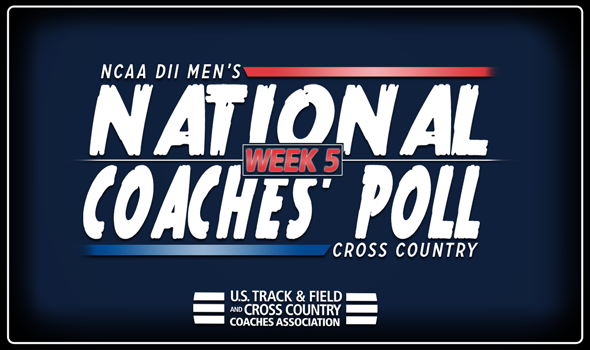 NEW ORLEANS – As the NCAA Division II Pre-Nationals are just a few days away there wasn’t much movement to be had in the latest edition of the NCAA Division II Men’s National Coaches’ Poll released by the U.S. Track & Field and Cross Country Coaches’ Association (USTFCCCA) on Wednesday. The site serves as the host of the NCAA Division II National Championships on Saturday, December 1. Adams State kept the No. 1 spot for the sixth consecutive week to open the year after once again receiving all eight first-place votes. The Grizzlies wrapped up their regular-season portion of the schedule with a fourth-place finish at the Fort Hays State Tiger Open this past weekend. They did not run their top unit at the meet. Adams State has now matched it six-week run atop the charts it accomplished during last year. The team will be back in action with the running of the Rocky Mountain Athletic Conference Championships on November 3. Grand Valley State remained in the No. 2 spot after a second-place finish in the red race of the Bradley Pink Classic. They were the top Division II program at the meet and will be off until the GLIAC Conference Championships on November 3. Also staying put was No. 3 Colorado Mines after taking tenth overall at the Fort Hays State Tiger Open this past weekend. They too did not run their top scoring unit. The Orediggers will be at Pre-Nationals this weekend. Holding in No. 4 was Chico State after the group won the invitational race (and the open race) at the Bronco Invitational. The Wildcats will have one more regular season meet with the Doc Adams Open on November 3. Dropping one from a tie last week was No. 5 Western State. The Mountaineers were off from competition this past weekend and will run at its 68th W Mountain Race on Saturday. Improving one to the No. 6 spot was Queens (N.C.) after it won the team title at its Royals Cross Country Challenge this past Friday. The program will be heading to compete at Pre-Nationals this Saturday. Dropping one to No. 7 was Augustana (S.D.) after the Vikings took second at the Jim Drews/Tori Neubauer Invitational over the weekend. The group will have one last regular season meet with the Mount Marty Invite this Saturday. Holding at No. 8 was Simon Fraser after another off week from competition. The Clan haven’t raced since a third-place finish at the Conference Crossover Invitational in early October and will be back in action this Saturday with the Western Washington University Classic. The biggest improvement in the poll belonged with No. 9 Mount Olive who shot all the way into the top-10 after being unranked the previous week. The Trojans finished second at the Royals Cross Country Challenge this past week and will race this Saturday at Pre-Nationals. Falling one to round out the top-10 was No. 10 Saginaw Valley State. The Cardinals were off from competition and will run again this Saturday at the Wayne State Warrior Challenge. The largest improvement other than Mount Olive made from the week before was just a two-spot gain by No. 15 Walsh. Two other programs gained one spot while 16 teams experienced a small drop in rank. The biggest fall was just four positions. In total 21 of the top-25 programs experienced some sort of change even if none of them were very big. Also new to the poll this week was No. 23 Alabama-Huntsville, No. 25 Southern Indiana and No. 25 Edinboro. It a new program high for Alabama-Huntsville. Alaska Anchorage, Embry-Riddle (Fla.), West Texas A&M and Augusta received votes.